In a nutshell this acquisition would mean reduction in power supply interruptions and faster relief to the consumers. This is achieved supposedly with faster response via deployment of smaller gensets but larger in numbers, to cover more strategic and critical areas. Reading today's local dailies, you read and get what's necessary for general information. But from technical standpoint, I was a bit frustrated that none of the three papers (NST, Borneo Post & Daily Express) give sufficient information about the mobile gensets technical information apart from stating the obvious -- generator capacity and number of sets. Then again, that is all that matters to the general public, I suppose. Too bad. Had I known of the event earlier I would not have hesitated to walk in as spectator. Having 14 trucks with capacity of 500kW each, SESB will now have 'additional' generating capacity of 7MW at its disposal to attend to power interrupted areas. So, when there are scheduled power outages which normally last for 8 hours in most cases, this new truck loaded with power generator will be able to last that long. In my own experience in Kota Kinabalu and Penampang areas, when requested, SESB would send their "Tenaga segera" mobile genset to cater for our industrial power need. KOTA KINABALU: Sabah Electricity Sdn Bhd (SESB) now has 14 brand new mobile generator sets to provide faster response to consumers during power supply interruptions. Its senior general manager (asset management), Muhamad Nazri Pazil, said SESB had spent close to RM12 million to acquire the new generator sets from WZS PowerGen Sdn Bhd, the company appointed to design and assemble the mobile power provider. “We have seven units with us now which will be assigned to be on standby here in Kota Kinabalu, while the other seven will arrive in October and will be sent to assist the remaining focus areas in the East Coast,” said Nazri, during the handing over ceremony at the SESB compound here yesterday. The 500Kw mobile generator sets, with a capacity to cater to about 200 to 300 houses at once, will be located in focus areas statewide, namely, Kota Kinabalu, Sandakan, Tawau and Labuan. The 14 new units, he said, adds on to SESB existing assets of nine mobile generator sets of bigger capacity in Malawa, which are being used to cater to commercial business districts (CBD), as well as its contractors’ assets, namely, MNI and LLP, which each owning 11 and two units respectively. Previously, SESB had traded in 25 units of used canopy (ground) generator sets, which Nazri said had been in use for about 15 years. The supply of the 14 units of 500Kw generator sets will enable SESB to provide faster response during power supply interruptions and improve the company’s quality of service. “Before this, we would have to call our contractors and settle payments before we are able to respond to power supply interruption reports but with these 14 new mobile units, we can go together which would cut down response time by half,” he said. 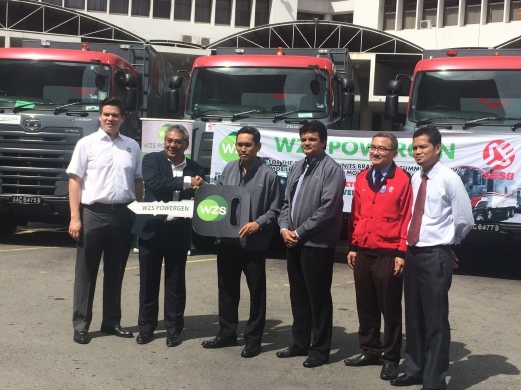 Also present at the handing over ceremony yesterday were SESB general manager Abdul Razak Salleh, deputy general manager (distribution) Ridwan Saham, and WZS PowerGen chief operating officer Dominic How.